This grayish perennial herb, often growing in large clumps, reaches a height of between 20 and 40 inches. 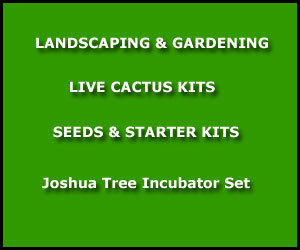 It has erect branches and, 3-lobed, scalloped-edged leaves which resemble the Maple. 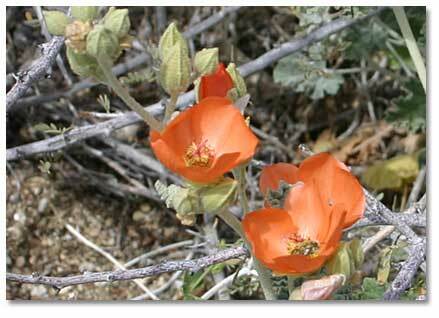 This, the most drought-resistant member of the Mallow Family (Malvaceae), is grazed upon by Bighorn Sheep and domestic sheep and goats. In wet years it forms spectacular orange display across the Desert Southwest. Mojave and Sonoran deserts of Southern California and Nevada, to southwest Utah through Arizona to northern Mexico. Sandy washes and rocky hillsides, sometimes among pinyon and juniper, below 4000 feet. Bright orange or apricot, 5-petaled flowers bloom year round. These cup-shaped flowers grow along upper stems to 1 1/2 inches wide. In some forms, petals can have white, pink, purple or bluish hues. The last common name is derived from the fact that the leaf hairs are an eye irritant to some people. Perhaps this is because the hairs are star-shaped, as can be seen under a magnifier. 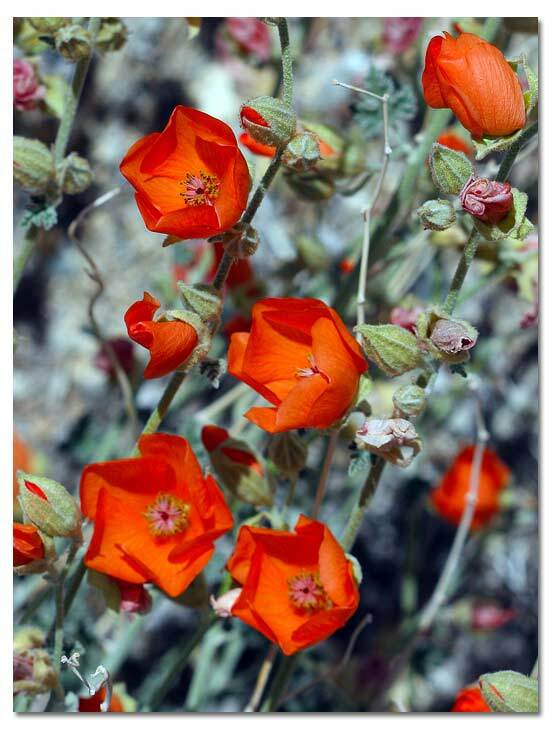 There are 9 species of Globemallow -- genus Sphaeralcea -- in California and 16 in Arizona.